Many users are happy with their computers the way they are and are not interested in upgrading to Windows 10. We’ve discussed some pros and cons, but if you have made up you’re mind that you’re not interested, here’s the best way to get Microsoft to stop bugging you. In short, you need to uninstall a particular Windows Update. Microsoft KB3035583 in particular. After it is uninstalled, you’ll need to reboot your computer, search for Windows Updates, then hide KB3035583 to make sure it doesn’t automatically reinstall itself. The step by step instructions are below. In Windows 7, click the Start Menu in the lower left, then type Programs and Features. In Windows 8/8.1, from the Start Screen (with all of the tiles) just type Programs and Features. you can type anywhere on the start screen, even if you don’t see a cursor to type with – the search bar will slide in automatically from the right hand side! Click Programs and Features from your search results – this will take you to a list of programs installed on your computer (the old “Add/Remove Programs” as it was called in Windows XP). On the left hand side, click View Installed Updates. Then click “Update for Microsoft Windows (KB3035583)” and click the uninstall button above (or “Right Click” and choose Uninstall from the context menu). Once this is done, the computer will prompt you to restart. Do so. 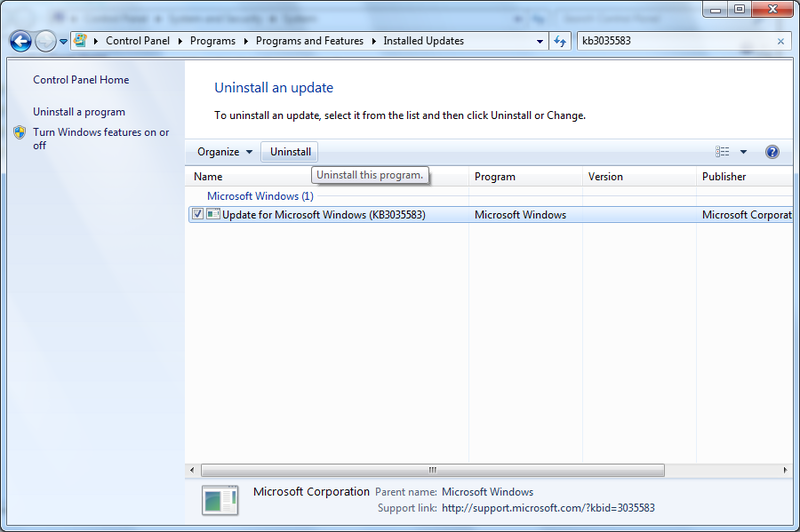 Search for “Windows Update” from the Start Screen or Start Menu, just as you searched for “programs and features” in step one. On the left side, click Check for Updates. Click on “Important Updates” and look for KB3035583. Right click on that specific update, then choose “Hide update.” You will no longer be prompted to upgrade to Windows 10.